Stephens Memorial Chapel was a long time in the planning and building process. Rick and Gloria Stephens started Stephens Memorial Chapel in November of 1996, located adjacent to Fairview Cemetery in Pryor. In October of 2014, Rick and Gloria bought out Key Funeral Homes of Pryor and Locust Grove. The Key locations were closed and brought into the Stephens location in Pryor to reduce overhead and keep pricing affordable. 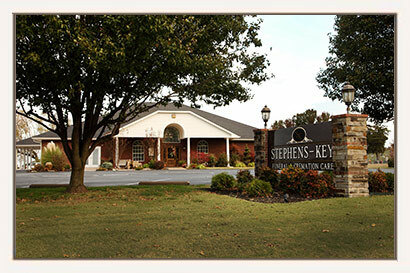 The name was changed from Stephens Memorial Chapel to Stephens-Key Funeral & Cremation Care. After the purchase of Key Funeral Homes, the building underwent a remodel and update, keeping with a light and airy feeling of decor. A chapel, with seating that is adequate to hold a larger service, but not overwhelming when a smaller service is held. The largest chapel in the area, it will seat 168 people without setting up any of the overflow area. In December of 2017, Rick and Gloria sold the firm to Tom and Hayden Kennedy. The Kennedy's sold their Tulsa area funeral homes to focus on the Pryor area. Tom and Hayden are excited to be a part of the community, and are very involved in many civic organizations.